An eerie, watery reimagining of the Oedipus myth set on the canals of Oxford, from the author of Fen The dictionary doesn't contain every word. Gretel, a lexicographer by trade, knows this better than most. She grew up on a houseboat with her mother, wandering the canals of Oxfor... read full description below. An eerie, watery reimagining of the Oedipus myth set on the canals of Oxford, from the author of Fen The dictionary doesn't contain every word. Gretel, a lexicographer by trade, knows this better than most. She grew up on a houseboat with her mother, wandering the canals of Oxford and speaking a private language of their own invention. Her mother disappeared when Gretel was a teen, abandoning her to foster care, and Gretel has tried to move on, spending her days updating dictionary entries. One phone call from her mother is all it takes for the past to come rushing back. To find her, Gretel will have to recover buried memories of her final, fateful winter on the canals. A runaway boy had found community and shelter with them, and all three were haunted by their past and stalked by an ominous creature lurking in the canal: the bonak. Everything and nothing at once, the bonak was Gretel's name for the thing she feared most. And now that she's searching for her mother, she'll have to face it. In this electrifying reinterpretation of a classical myth, Daisy Johnson explores questions of fate and free will, gender fluidity, and fractured family relationships. 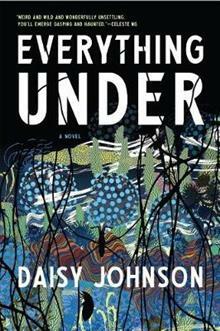 Everything Under--a debut novel whose surreal, watery landscape will resonate with fans of Fen--is a daring, moving story that will leave you unsettled and unstrung. Daisy Johnson is the author of the short-story collection Fen. She is the winner of the Harper's Bazaar Short Story Prize, the A. M. Heath Prize, and the Edge Hill Short Story Prize. She lives in Oxford, England, by the river.